I write this outside on the floor of my old porch, wind tugging at the trees, shadows playing on the grass. I moved into a new house yesterday but there’s no internet there yet. All my belongings are piled higgledy piggledy in rooms, boxes and corridors. Life is in disarray and will take a while to get sorted out. Yesterday I heard my son Max aged nine telling his friend that the longest he’s lived anywhere is five years. Then I realised that since I left home, aged 16, to go to boarding school, I’ve never lived anywhere for longer than five years either. That was the same house Max was thinking of, and the place where he was born. The house I’m moving out of today wins second place for longest time lived in. We’ve been here two-and-a-half years. In the last 27 years I’ve lived in eight countries, in four different continents, and visited around 40 other countries. I must have slept in hundreds of beds. Maybe thousands. I love to travel but moving house is boring. Especially when you don’t want to move. But my landlords want their house back so we must go, and the lease on our new home is only 12 months, so I probably won’t be there long either. Almost certainly not as long as five years. Hopefully, house prices will settle soon and we’ll buy a house again. I’d like to live somewhere for longer than five years again. Moving used to be easy. I never had much more than a backpack. Now I have a husband and three children so the luggage and belongings have also accumulated. Even though we’re not huge consumers, and don’t own massive amounts of stuff, there’s still a lot to be carted around. Moving house is known to be one of the most stressful times of your life. It’s right up there with a death in the family or divorce. I have been feeling the stress but, generally, I’ve handled it better than I would have after Max was born when I was suffering from post-natal depression. Then even the smallest events caused untold stress and sleepless nights. Now I’ve learnt to allocate the stressful events fit to the fringes of my life. The packing, cleaning and organising are on-going, but I still focus more on the things that make me happy like daily walks on the beach, laughing with the kids or friends and writing. Our business is location independent but we are not. Our children need the stability now of going to the same school and growing up with familiar faces and good friends. The digital nomad lifestyle holds no appeal. I’ve always worked hard, saved money and then travelled and I plan more of that in the future. While our children are still at school we’ll be based here, but that doesn’t preclude trips in and outside of Australia, as well as our planned six month safari in Africa. So here I am. Definitely not a suburbanite but moving into my second home in a distinctly Australian suburb. Definitely not a digital nomad but certainly nomadic and able to work from anywhere thanks to the internet. We can’t be defined by where we live or what we do. We can only choose a lifestyle that makes us happy 90% of the time. Living here in a stable country with good schools, fine weather and glorious beaches does that. But I am also learning to be flexible and eternally grateful for all that is good in my life, even when things happen that I didn’t choose or want. I don’t know how long I can stay in my new house or where we’ll end up after that. But all I can do is be happy that right now the sun is shining down on me and this old porch. Soon the kids will get back from school then we’ll start unpacking and preparing for fresh adventures in our new home. Nomadic, static or just down right erratic. Whatever you call it, life is good. It’s great to hear you carve out your lifestyle to suit your purpose, as too many lose their sense of purpose, while trying to create a lifestyle. Annabel, you’ve done well to clock up five years in one house! My maximum timeframe is two years. Although relocating to a new city or country has always been exciting, it still surprises me how much “stuff” I accumulate within each two-year cycle, despite a massive spring clean before each move. I’ve been on the Sunshine Coast for 2.5 years now and am feeling quite settled for the first time in my life! Of course, that doesn’t mean I won’t go off travelling again, but I’m happy to stay put for now in this glorious place we live. Its strangely incongruous how the word ‘moving’ to the ears of a traveller can make you perk up and go misty eyed, but add the word ‘house’ onto the end and one’s demeanour immediately sinks in pain! And as time goes on possessions associated with past places and experiences of course not only grow – dare I say they multiply? Hi Linda, you hit the nail on the head. I was craving a sofa after 18 months of being uncomfy everywhere except in bed in Central America. Then other creature comforts sneak in and before you know it you’ve created a little prison for yourself! I LOATHE moving house! But after a lifetime of having to do it fairly frequently, I can see the benefits. Apparently moving house 4 times is equivalent to being burnt out once – so I’ve learned not to become attached to material possessions. And dealing with change while being pushed out of my comfort zone gives me the impetus to discover new places, people and experiences I wouldn’t have otherwise had. It’s all positive – ultimately! It’s just one life – why spend it doing the same thing in the same place?? Completely understand your viewpoint, Annabel. I see location independence as partly a mental attitude – the knowledge that you can move and can run your business from anywhere in the world, even if you choose not to. I also choose to stay most of the year in one place so that my daughter can attend school and make friends. I love your flexibility and sense of adventure, Annabel. Clearly you are willing to do whatever it takes. As long as we keep our mind on the move it matters little whether we settle down or keep moving. Most folks get trapped in a mental stasis but the mind is a natural Nomad, seeking change and new views. You have the best of both! Hi Rob, what a great though. Even if we don’t move physically we are still open to change and changing within ourselves:) Love that. Thank you! We are currently 9 years in our house which now holds the record. I hate the process… packing and unpacking… but moving is what has kept us from being pack rats. When you have to pack up every few years you throw a lot of stuff away. Keeps us ‘light’. I feel you pain but celebrate your attitude! Well you sound like a happy camper to me and what more could you ask for. I’ll be right there with you in the madness of the move in a few weeks. A friend of mine reminded me recently that this is the third time we’ve moved in the last 4 years. But this was a move worth making, and I’m glad we’re doing it, even though the pain is high. I don’t really want a nomadic lifestyle either. I think we’ve got 3 years in England and then we’ll pick a place we can stay a while. Sometimes it’s hard for me to remember what it’s like in one place for a long time. Do you find the kids dislike it, or are they accustomed? As you seem to demonstrate so well, it is important to live in the moment and enjoy what is now, rather than get bogged down in the stresses and inconveniences of making another move and settling into another place. Having just uprooted once again, moving across an ocean to Moldova, I am acutely aware of how important it is to stay positive and look at the happy side of life. As a serial expat I’ve made many moves, and generally I love the expat life, but each time the settling in is a hassle and making a new place feel like home is not always easy. Carpe diem. Be mindful. Live in the moment. It’s the best way to deal. Hi Miss F, settling in does have problems but making new friends always takes longer. I think social media would make that easier and luckily since my move is a mini move only 200m down the road I don’t have to deal with that this time. Good for you, Annabel! So many travel and blogging sites espouse the nomadic lifestyle as the ultimate goal, and imply if you don’t want it or can’t achieve it, your own site and lifestyle are somehow lacking. Like you, I love to travel, but also want listen to the rhythms of life. Everything has its season! P.S. The Australian suburbs look really lovely. Having moved countries a few times I empathised with this post quite a bit. I certainly feel the difference between travelling and moving (house)…they are world’s apart! Happy moving Annabel! I think its one of those things nobody really enjoys doing but I know in my heart, whatever the challenge, you and your family will always find the positive and joyful side of things. Aren’t housing prices down in Australia right now as they are in the U.S.? Wouldn’t this be the time to buy, but not to sell? Just curious as you mentioned buying. This is defo one of my favourite blogs of all time…not sure why it struck so much of a cord but I was glued from start to finish and was left with excitement and questions in my head…where will you be in a year? How are you going to take 3 kids on a safari? Do you ever get nervous about that or put off by people saying ‘You can’t do that with 3 kids?’ I’m pregnant and people have already started saying to me…’You can’t be thinking of travelling with a baby!’ When I mention I don’t know if I want to stay in England or not when the baby is born. Do you ever worry that the ‘worry-heads’ may be right and that one of your precious ones will be eaten by an anaconda on your travels? Moved fifteen times in twenty-five years as a Navy Dentist and when I finally settled after retirement I found that I had accumulated enough memories and memorabilia to write a book, “Harnessing a Heritage”. Have you expanded on the material in your blog to be a book? I hate to tell a nomad like you but it’s time to settle down, at least for a while until the kids grow up. I know from personal experience. I’m glad for you that you did so much traveling when you were young because, though the urge remains, it’s not as easy later on especially if money is limited. Some 50 and 60 year olds can still backpack, but that often depends on your health, and I can’t see you going on cruises. It sounds like you’re at the point where you’d like to have a home of your own but be able to close it up and take off and travel from time to time. Ideal – if you have the wherewithal – because I can’t see you staying in the same place. But beware of the consequences. All my life, I led an unsettled, rather nomadic existence that involved five country moves (one with a 6-week old baby), about 12 cities (stays of more than 6 months), and uncounted smaller stays. This changed when my kids were growing up and I stayed in the same home 15 years. A wise choice as they needed security. Since then, I’ve been uprooted – forcibly and voluntarily – so many times that for four years, in my 50s, I never slept in my own bed or had my own closet. Finally, I found a kind of security – boring but necessary – only to have to move again – 3 times – in the past year at an age when I’d rather stay in one place. I don’t own a home, I can’t vote – not even in England, and I’ve never really belonged anywhere – maybe a bit more in Mexico where I’ll always be a foreigner. I don’t have the slightest idea in which country I’ll end up. I guess you could call me a reluctant nomad. Is there a reason why you travel so much? I plan on doing alot of traveling too, but you seem to travel with your family and relocate from place to place? What motivates you to do so? and where is the place you loved the most? I can see the attraction of traveling and that it must be addictive. I wish my partner and I had travelled more whe we were younger,now we are entering our 60s it’s not so enticing to give up the comforts of home and now settle for shorter holidays in comfortable accommodations. I think it’s great you have had the best of both worlds. I wanted to thank you so very much for your post. I am just 25 but have been moving every 5-6 months for years, fluctuating between wanting to travel, wanting to move, and wanting to settle down. This is exactly what I needed to read – that I can both be nomadic and be settled. And to make the most of each day whatever I end up doing. Gosh, I’ve been reading the top rated travel blogs for the last 3 days, trying to understand how all this travel blogging works, and I finally found a woman with whom I can relate. Yay! I too went away to boarding school (at 15) and have never been in one place more than 6 years. I too love to write and take photos. I have published over 30 feature stories in glossy travel magazines and have published 6 glossy travel magazine cover photos (with 2 more on tap in 2013). For the past 6 years I have been traveling full-time with my husband via sailboat and RV. And I’ve been “blogging” about it for 5. Taking a breather to look beyond our own thrilling adventures, writing and photography to see if I might add a person or two to my loyal but modest following, I am just beginning to learn about the wacky world of post-college-graduate digital nomad travel blogging. Their world is very foreign to me! How cool that you say more-or-less the same thing in this post. The travel blogging world I come from — full-time RVers and world cruising sailors — is more a world of online diaries without sponsorship or efforts to sell hotel rooms or travel advice. Our community travels constantly in a linear fashion, so a blog is a place to keep a record of movements and sights seen. The digital nomads are often based out of a home somewhere and travel a jet-based star pattern from there. My group is largely baby boomers. Many of the top digital nomads are younger than our kids. I’m a full-time traveler and active travel blogger with a rapidly climbing Alexa rating, and I am finding it fascinating to see the two different travel blogging worlds out there. I straddle both. How nice to find you– I look forward to reading more of your blog and seeing what you recommend for successful travel blogging. Sounds like you’ve seen a lot of the world. We’ve been nomadic for 2 years now. We left our jobs in London and have yet to look back, we’ve no family, yet, but I hope that once we do feel the pull towards starting our own brood we can remain true to our desire to explore. 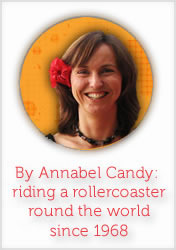 I’ve thoroughly enjoyed exploring your blog Annabel. Thanks for sharing! Just came across your blog today for the first time. You have a fantastic blog. I really like the travelling lifestyle. Have been living in nthe Gold Coast, Australia for two half years. From New Zealand. I just love the travel fever. I would love to travel again, but at the moment, the weather is beautiful here, beaches are also breathtaking. Im so comfortable. I suppose I’ve got to take action to move again. Hopefully the next excursion has the same comforts. I’m a little bit late but glad I found it. You are truly an inspiration. I’ve moved over 30 times in the past 8 years and nearly 70 in my lifetime (I counted!). Only now at age 40 am I starting to see the beauty in my, apparently inherited, nomadic lifestyle. Stressed? Yes! But you helped me to just be at peace with wherever I am at any given moment and find joy in the little things. Thanks!